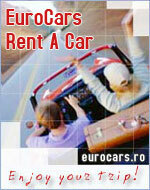 Category: *** Address: 47, Ciocarliei Str. Hotel Paradis from Cluj is a new business hotel, with a modern and nonconformist architecture, opened in 2000, being in a continuous growth ever since. The hotel is 10 minutes away from the Cluj-Napoca International Airport and 5 minutes away from the centre of the town, near by the most important exhibition centre in Cluj-Napoca, Expo-Transylvania. The hotel has a capacity of 55 places, and offers the next accommodation options in a warm and hospitable atmosphere: 11 double rooms, 10 matrimonial rooms, 3 single rooms and 5 suites. The Romanian traditional restaurant, with its 70 seats, offers a variety of menus and Italian specialities, in a pleasant atmosphere. The restaurant can be booked for different events and can organise different shows. The breakfast is served in �Swedish buffet� style and is included in the accommodation tariff.